Chevron managed a full carriageway closure on a bridge replacement project for Balfour Beatty in Cheshire. The company closed the M56 between junctions five and six, while a pre-assembled bridge was lifted into place. 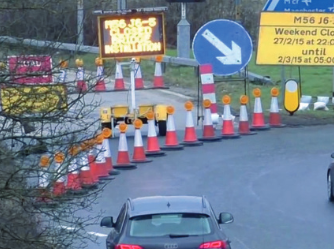 The company required an automated traffic management system to help minimise the number of workzone incursions and to safely manage those that did take place, while reducing the number of personnel deployed in dangerous perimeter guarding duties. Chevron deployed MVIS’ and Highway Resource Solutions’ workzone incursion solution, part of Intelligent Safety, the first collection of temporary road maintenance safety solutions combining modular electronic perimeters and variable message signs (VMS). VMS were deployed at four closure points, with live streaming CCTV mounted on the same platforms. The VMS were surrounded by intelligent cone barriers and contactless sensors to detect breaches. VMS messages in advance of the workzone warned road users of the closure and surveillance. The solution meant that only two personnel per shift had to be deployed in perimeter guarding roles, so the rest of the team was able to undertake work elsewhere on-site, in lower risk locations. During the weekend, there was only one workzone breach, a figure Chevron attributed to the high impact of the VMS signs. But when the perimeter was breached, the system gave a textbook performance. The sensors detected the incursion, automatically triggering a VMS message to alert the driver of their error, encouraging them to stop before they reached the area in which workzone personnel were located. The gatemen positioned at strategic checkpoint locations received an automatic audible alarm. This alerted them to the incursion, enabling them to stop the vehicle in question. They were equipped with a manual panic alarm to warn the workforce. “While improving the safety of our workers, we saved four men and four vehicles per shift. The VMS element also meant that we were able to improve the information available to road users negotiating the roadworks. John Walls, Area Manager at Chevron.